Just about everybody has a habit or two they would like to change. I confess that I have definitely developed a few over the years. Thankfully there are some I have successfully broken or changed. Unfortunately, like most other people, I have a few I am still working on. But the bad habits that deserve top priority in everyone’s lives are the ones that cost us money. One of the ways to eliminate bad habits and save money is to stop blowing extra money. Cash windfalls in the form of tax refunds, end of year bonuses, or inheritance money are often spent on stuff. Rather than using found money on things not within the normal scope of your budget try using it differently. Pay down debt, add to your emergency fund, or invest it for your retirement instead. A great thing about the new year is the resolutions we all make. Yet, at the same time, I really don’t like them. But let me explain. New Year’s resolutions are just excuses to start doing the things we should already be doing. That’s why I don’t like them. However, I also think New Year’s resolutions have their place. They can be a time to reset and get back into good habits. When you use them to make real and permanent changes in your life I think they are useful. One of those new habits could be to always watch for new ways to save. For example, try replacing your high cost cable television with something cheaper, such as Hulu. But to save even more you could simply shut it off all together. Another way to eliminate bad habits and save money is to correct your perspective. It is easy to find excuses that justify spending money on things we want. For example, I used to “need” to get my nails done every two weeks because I worked with the public. I felt like my hands were constantly on display. Therefore having a manicure would make me appear more professional. Once I realized the amount of money I was spending on my “need” I was able to readjust my thinking. In fact, doing away with this monthly bill helped me quit my full time job to freelance instead. When you don’t have money set aside for emergencies you will probably land in financial hot water eventually. There’s just not a way to plan for everything that could come up in your life. Do yourself a favor and save a little money each month, even if it’s as little as five or ten dollars. Each time you have a little extra money add to your emergency fund. Then when a real emergency arises you will be able to handle it. If you really want to eliminate bad habits and save money you need to stop trying to keep up with the Joneses. What they think of you isn’t as important as your financial well-being. Quit buying more stuff in order to fit in with them or rise above them. It isn’t worth putting yourself in debt and sacrificing your retirement. Life happens and things change. As a result, needs, goals, and budgets must change too. If you keep the same budget month after month and year after year it won’t be accurate after a while. Expenses and needs that change drive your budget to change. That’s why it’s a good idea to review your budget at least once each year. When you get off track occasionally with your budget, examine why it happened. This is an important part of preventing it from happening again. 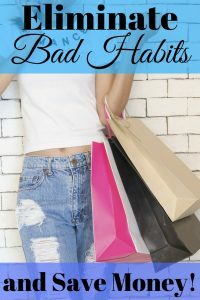 We all have bad habits we’d like to change. Nevertheless, if we wish to eliminate bad habits and save money for the future we must not ignore them. Do you have a financial bad habit you’d like to change?